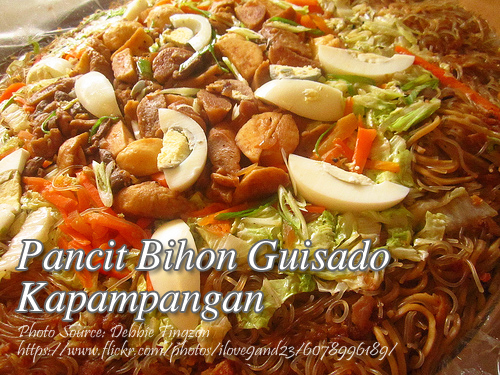 A Kapampangan pancit bihon recipe which is more tasty than an ordinary pancit bihon guisado. Kapampangan dishes is well known for being delicious and tasty than the other regional dishes in the Philippines. To cook pancit bihon guisado; Heat oil and sauté 1 teaspoon garlic. Add fried tokwa and pork, shrimp and shrimp juice. Season with patis, salt and pepper. Cover and allow to boil. Add cabbage and kintsay and cook for 1 minute. Add bihon and cook until done. Remove from fire in another skillet sauté the rest of the minced garlic in a little oil until brown, add green onions and kamias. Sprinkle over cooked pancit. Garnish with hard-cooked eggs. Heat oil and sauté 1 teaspoon garlic. Add fried tokwa & pork, shrimp, atchuete extract and shrimp juice. Season with patis, salt and pepper. Cover and allow to boil. Add cabbage and kintsay and cook for 1 minute. Add bihon and cook until done. Remove from fire in another skillet sauté the rest of the minced garlic in a little oil until brown, add green onions and kamias. Sprinkle over cooked pancit. Garnish with hard-cooked eggs. Hi! It doesn’t say anything on atsuete. When do you add it in? Thanks. Hi Grace, sorry for the typo. I’ve corrected the recipe already. Thanks for your feedback!